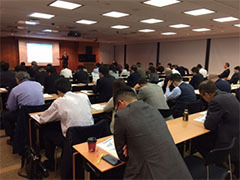 The Japan Bank for International Cooperation (JBIC) hosted its "Overseas Investment Seminar: Overseas Business Operations by Japanese Manufacturing Companies" on December 5, 2018. 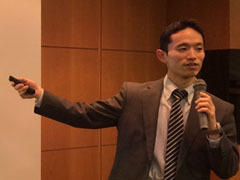 Takeshi Kasuga, Director, Division 1 of the Strategic Research Department, presented the results of the FY2018 JBIC Survey Report on Overseas Business Operations by Japanese Manufacturing Companies ("FY2018 JBIC Survey Report"), which marked the 30th year since it was first conducted in 1989. Another presentation was given by Mr.Toru Nishihama, Chief Economist at the Economic Research Department of Dai-ichi Life Research Institute Inc., on "Increasing Trade Frictions and the Trajectory of Asia's Economy." The seminar was a great success, attracting approximately 70 participants. Kasuga started the seminar by explaining the results of the FY2018 JBIC Survey Report. He showed that the overseas business performance of Japanese manufacturing companies for FY2017 was mostly robust. Also, he pointed out that companies seem more selective regarding the regions and countries in which they plan to strengthen their businesses, as they also want to assign more resources to domestic businesses. Meanwhile, the "Rankings of Promising Countries/Regions for over the Medium-term" shows bipolarization in the top countries. 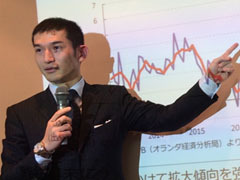 This year's independent survey topic was the "Impact of Protectionism," and Kasuga explained that more than 30% of the respondents are expecting a related decrease in profits, and that it will be increasingly important to closely monitor the effects such policies will have on long-term investment activities. Lastly, moving on to another independent topic of "Views on Environmental Regulations and Development of Environment-related Business," he reported that companies firmly hold the view that global tightening of environmental regulations can create an opportunity for expansion of their businesses. Mr. Nishihama followed with his presentation on the outlook and impacts of U.S.-China trade frictions, and the political and economic situation of major Asian countries, with a particular focus on China. He reported that U.S.-China trade frictions are expected to carry on for a considerable length of time, and the impact will become apparent soon. He expressed his opinion that, amidst slowing global economic growth, the impact is particularly likely to be felt among emerging countries in Asia, whose economies are highly dependent on foreign trade. On the other hand, China's market is huge even when viewed on the provincial level, and it continues to attract high expectations. Meanwhile, Vietnam has returned to the spotlight as a production base due to the "Comprehensive and Progressive Agreement for Trans-Pacific Partnership (CPTPP)." As a result, the outlook for Asia as a whole is somewhat positive. Mr. Nishihama finished his presentation by expressing his expectations for ASEAN countries. As infrastructure development strengthens economic connectivity and increases the clustering of industries within the region, these countries will come to act as a hub of the free trade area in the Asia Pacific. JBIC will continue to provide a broad range of information to assist Japanese companies in expanding their overseas business operations.